»Variations IX« is an interactive audio-visual composition of moving fabrics manufactured by historic weaving looms. 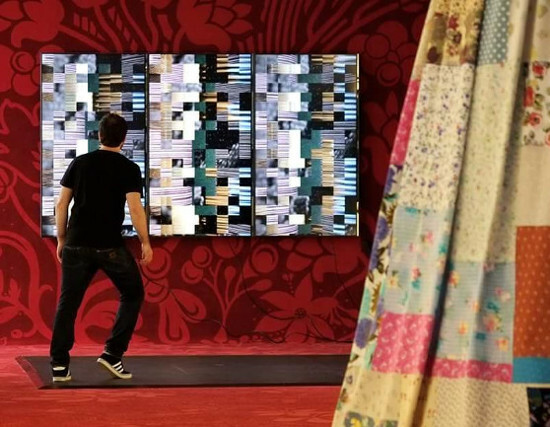 The moving fabrics are shown as a video collage on a triptychon represented by three large television screens. By moving across the SensFloor in front of the triptychon, the visitor can interact with the video collage and depending on their movements and position they interweave new visual fabrics and unique audio patterns. The art installation was set up from 22th May until 29th November 2015 at the »kunst I stoff« exhibition at the Staatliches Textil- und Industriemuseum Augsburg (tim). For the interactive art installation, Martin Burkhard used the openFrameworks toolkit for creative coding. For more information, please visit www.sourcedome.de/variations-ix/.